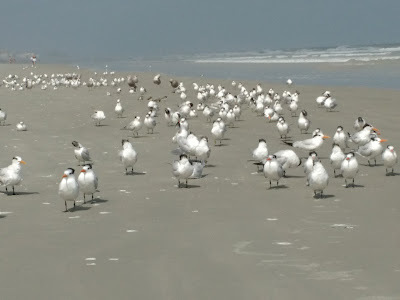 While Ralph went in the ocean for a quick dip late yesterday afternoon, I stayed on the sand watching a large gathering - called a 'highness' - of Royal Terns (Thalasseus maximus) on the beach. The Royal Tern, second only in size to the Caspian Tern, is a large grayish-white shorebird with an orange bill and a patchy cap of black-feathers that becomes much fuller during breeding season, which in Florida begins in April. 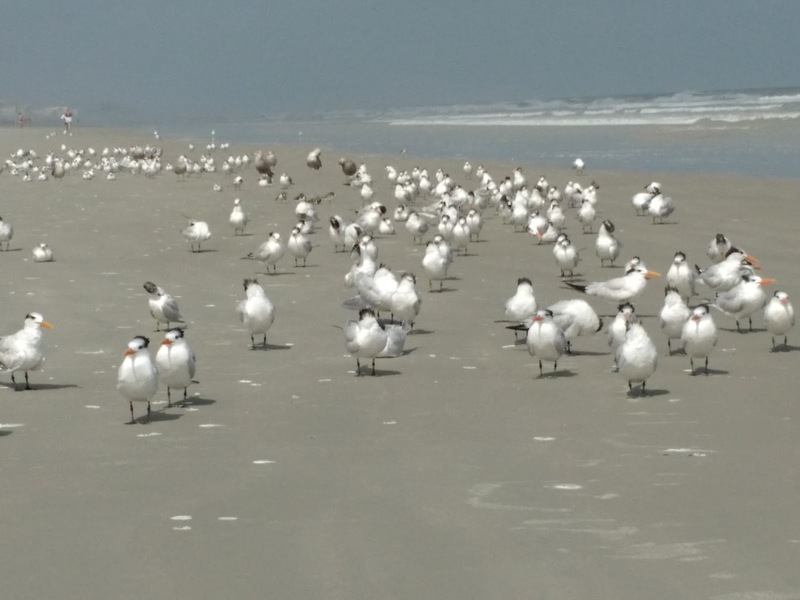 As my husband cooled off in the salty water, the birds - there must have been about 40 or 50 of them - stood together on the shoreline facing south, the direction from which the wind was blowing. Standing on strong black legs, the birds took turns (terns?) stretching, preening, bathing and resting after what I assumed must have been a busy day catching fish, crabs and squid, the preferred food of these distinctive-looking, commonly seen beach birds. Below is a short clip I took of the gathering - the 'highness' - of Royal Terns doing what Royal Terns do when they congregate on the beach.